Did you know you can grow plants in a bucket, without needing any sunlight? 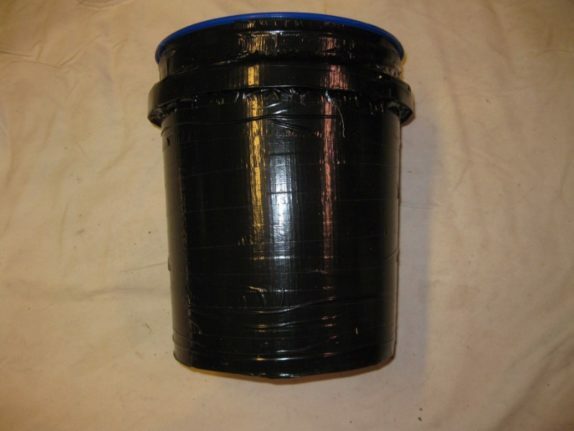 Such buckets are called “space buckets”. 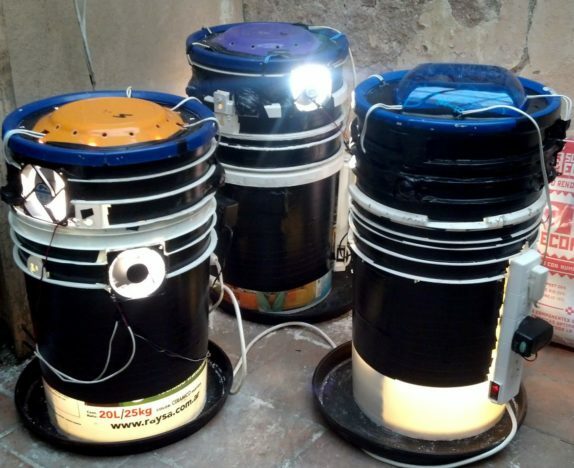 These buckets contain a design with LED-lights that allow a plant to grow without the need for sunlight. 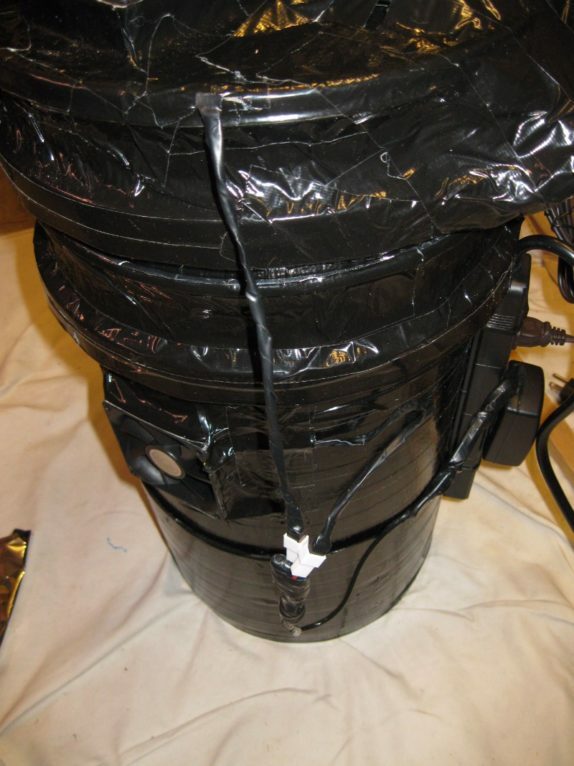 At slightly over 100 dollar per bucket, these buckets are not cheap to build, but they’re a great experiment, especially for people who have rooms without sufficient natural sunlight to grow plants in. 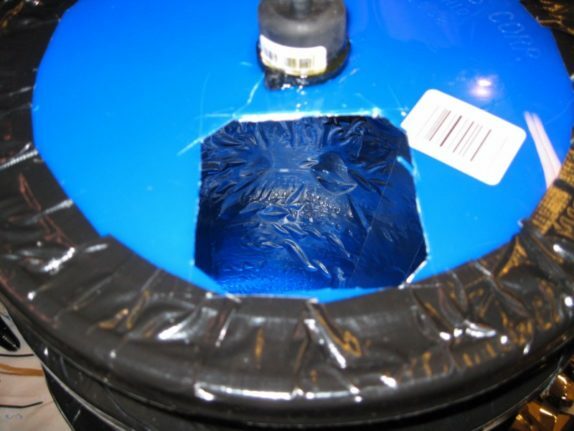 We recommend building your own space bucket, following the step-by-step guide below. 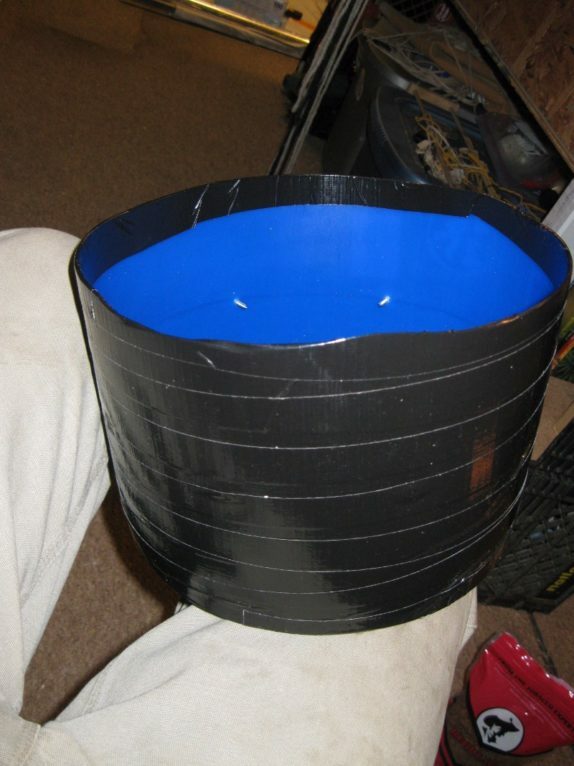 Step one: Take a bucket and wrap the sides completely in black duct tape. 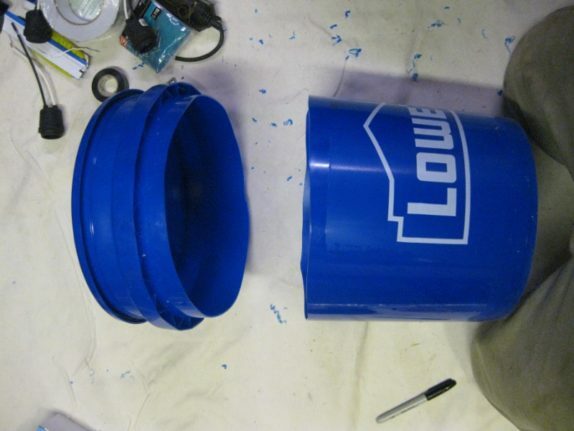 Step two: Use the duct tape to cover the bottom edge of the bucket. Step three: Using the largest drill bit, 3/8″, make a ring of eleven holes in the bottom of the bucket, to allow for drainage. Use a knife to remove any bits of plastic hanging from the drill holes. Step four: Take another bucket. 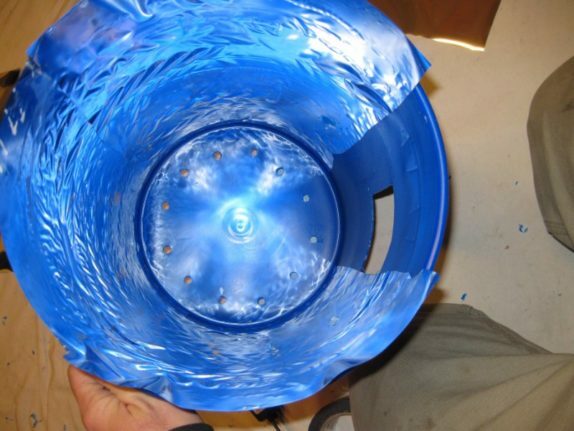 Find a line about 1.5″ below the bale ring that circles the entire bucket, then use a razor knife to score and then cut through the bucket to separate the future light-top from the future drain-pan. Remove the wire bale from the top of the bucket. 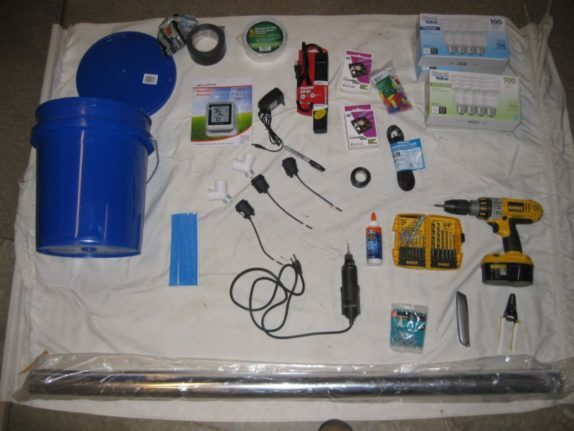 Step five: To start making the drain pan, we’re going to use 1-1/4″ wood screws, measure up 3.5″ from the bottom half of the bucket and make a line with a sharpie around the bucket. Put in 8 screws along this line, evenly spaced, as a rest for the space bucket to sit on. Step six: The bottom of the bucket has to be cut again: 7” up from the bottom make another line and trim the drain pan to be 7″ tall. 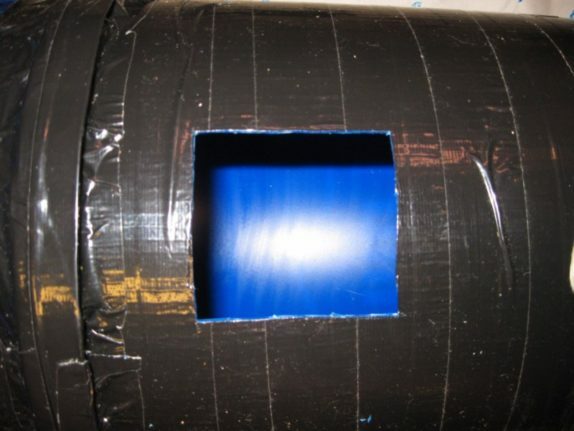 Step seven: Completely cover the drain pan with black tape on the outside. Make sure to cover the bottom and the top edges thoroughly too. The inside doesn’t have to be covered. Step eight: Remember those computer fans you bought? These will serve as ventilation for your space bucket. The fan probably comes with some extra screws and wires, put those aside for now. Just take the fan with the wire sticking out of it. 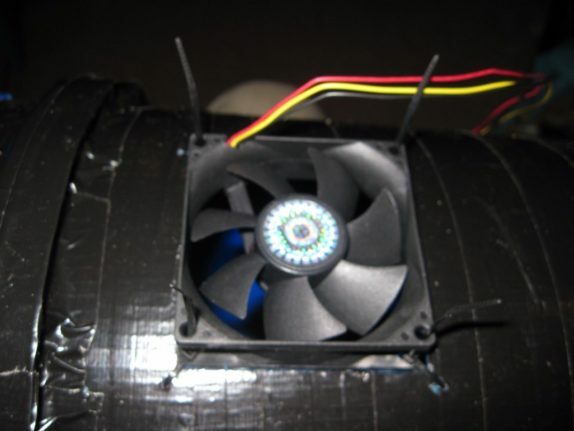 Step nine: Hold one of the computer fans in place along your intact black bucket. 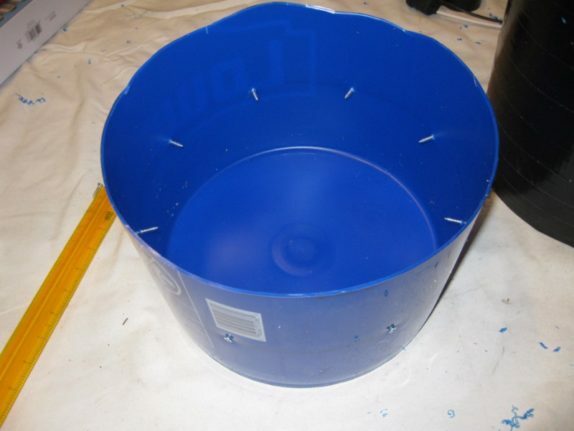 It doesn’t matter much where exactly you’ll place it, just hold it along the middle bucket to measure how big of a square hole you’ll need to cut into the bucket to fit the fan in. This hole will be where the fan blows air into the bucket. 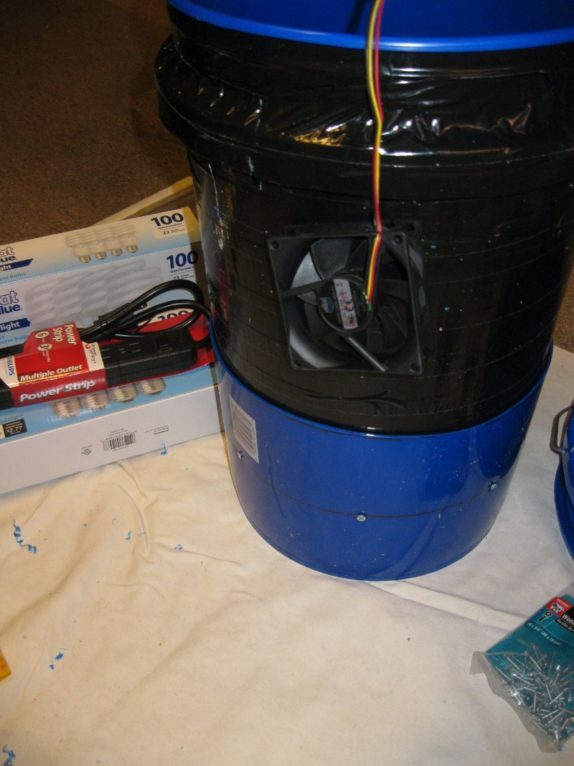 Step ten: We’re going to cut the hole now, where the fan will blow air into the space bucket. Make sure to save the plastic piece you cut out, it can be used later on as a tool to install the mylar. White buckets naturally reflect a lot of light. 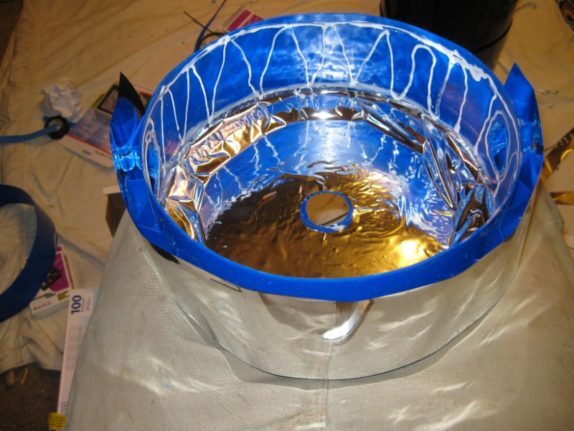 For any other color we recommend using mylar to make the inside of your bucket very reflective. Step eleven (optional): Lay the bucket down on the mylar and use a sharpie to mark your cut lines. Trim it until you have one long strip. Cut the strip into sections to make it easier to install. 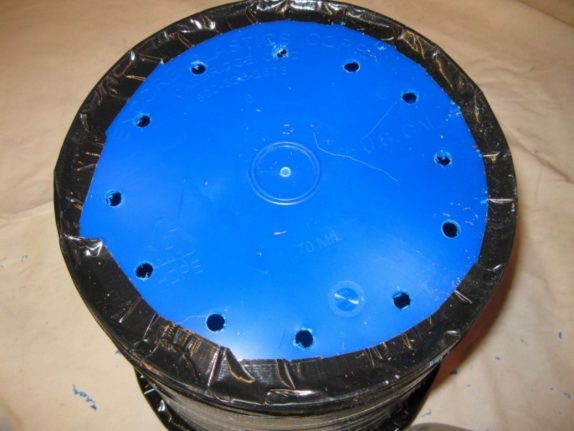 Use glue to paste these pieces onto the inside of your bucket. Overlap the mylar so there are no gaps. 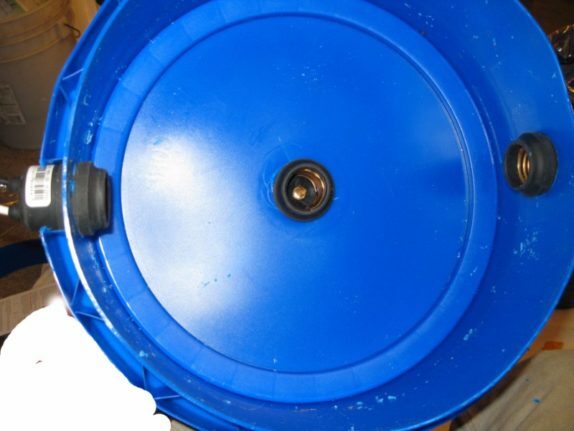 Use your knife to remove the mylar that covers the square hole, as well as any mylar sticking out at the top of your bucket. Step twelve: Take the Aluminum foil tape. 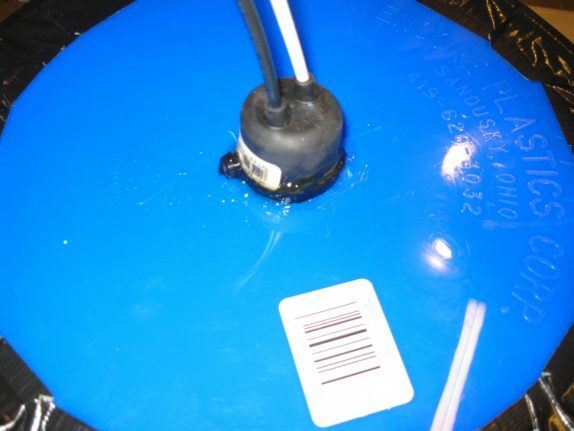 Use this to seal the top of the bucket, as well as for the square hole you made for the fan. Step thirteen: We’re now going to drill four holes into the bucket, which will be used to put the zip ties through that will attach your fan to the bucket. Using a 7/64th’s bit, drill four holes, roughly half an inch away from the corners of the square hole you made in your plastic bucket. Make sure to be careful during this step! Step fourteen: Now it’s time to put your fan in place. 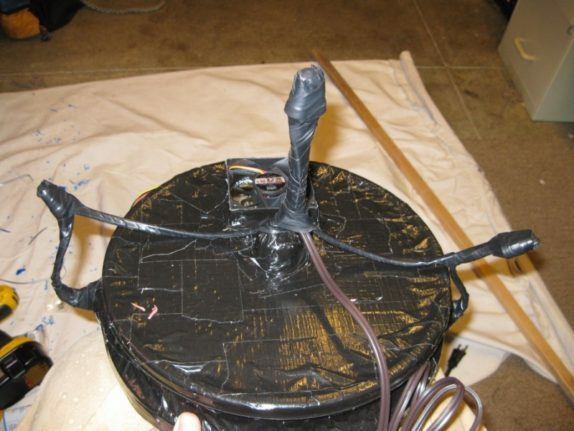 Make sure to put it so that the fan will blow into the bucket, then use your zip ties to tie the fan into place. 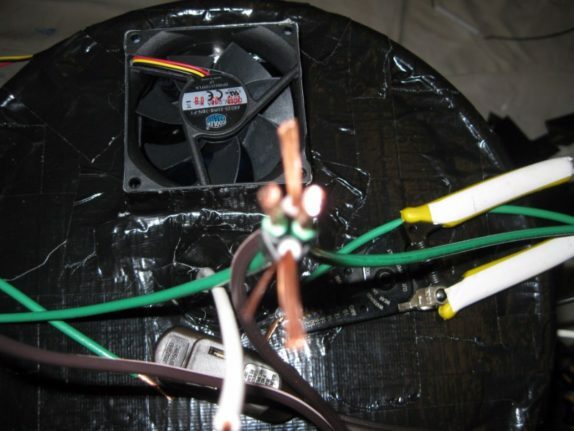 Step fifteen: Use small bits of aluminum foil tape, to cover the zip ties and any seams between the bucket and the fan. Step sixteen: Time to attach the power seam to the bucket. 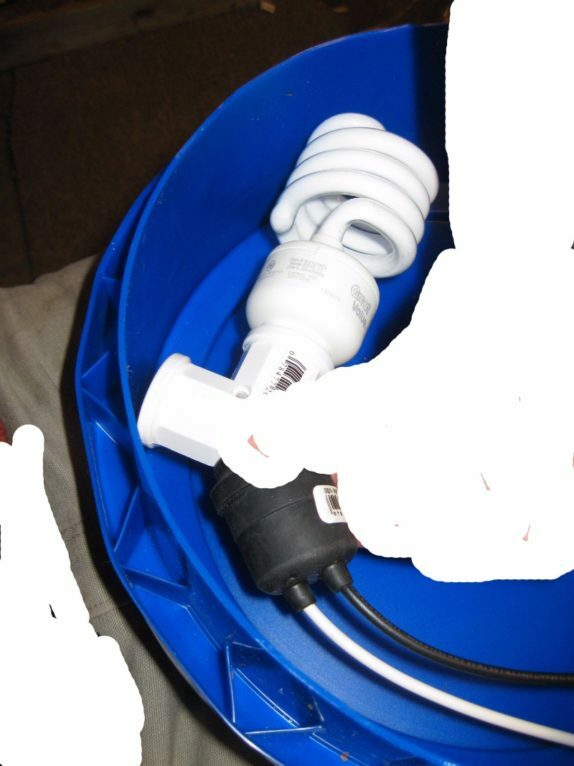 Cut out a section of the bucket to accommodate the cord from the power strip, then use your drill to drill two sets of holes on either side of the power strip and use zip ties to secure the strip to the bucket. 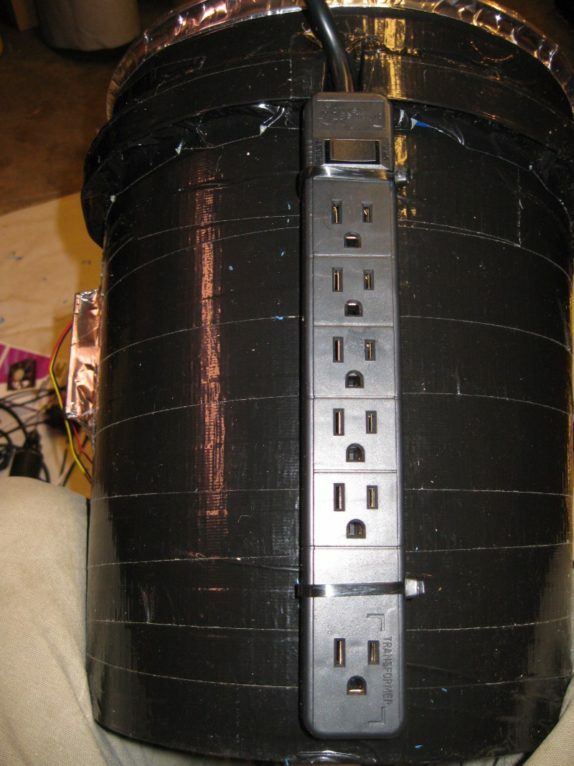 After you’ve attached the power strip to the bucket, use tape to cover the zip ties on the inside. Step seventeen: Make a hole in the drain pan to accommodate the power seam. Fitting the lamps, to see where the hole should go. Step eighteen: Now we will build the light top. Using a weatherized socket from Home Depot, check the diameter of the hole needed to make the lid to fit in the sockets. A dremel tool is a wonderful tool to cut the socket holes. We will use 5 bulbs in this light top. One in the center and two bulbs each in 2 Y-sockets from two sockets in the sides of the light top. Using a partially assembled light setup, we can see where to cut the holes for the sockets. Step nineteen: Use a sharpie to mark the best spot for drilling a socket hole. Then use a dremel to drill the socket hole. This will give you a relatively clean result. You could use a paddle bit, but it probably won’t give you as nice results as a dremel should, you may in fact damage the bucket. Step twenty: After drilling the hole, fit the socket in, then repeat step nineteen on the opposite site, so you get two socket holes. Both of your sockets will then fit two lightbulbs each. Then drill a hole in the middle of the bucket, where you will fit another socket. After your holes are done and the sockets are in, you can screw in the lightbulbs, to check if it all fits as it should. Step twenty-one (optional): Remove the sockets and lightbulbs again, as we’re now going to add the Mylar. 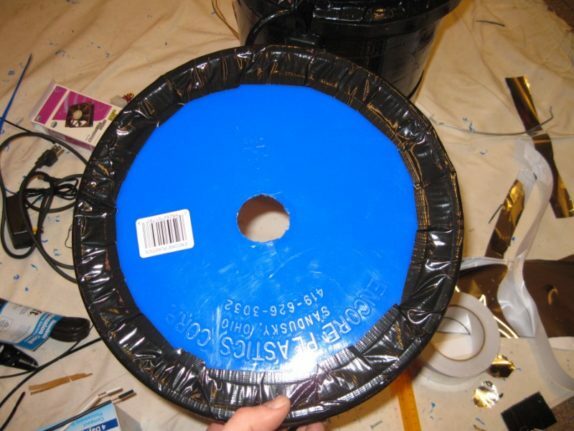 Use the lid as a stencil and use a sharpie to trace a circle onto a piece of mylar. Cut it out with scissors! Fold the circle of mylar into quarters (1/4th) and cut a curving cut along the red line. Unfold and you have a perfect circle in the middle of the mylar to allow for the center socket! Apply Elmer’s glue to the lid. Apply extra glue where the edges of the mylar will meet the plastic. Cut strips of mylar to match the width of the sides of the light top, these will be covered too. 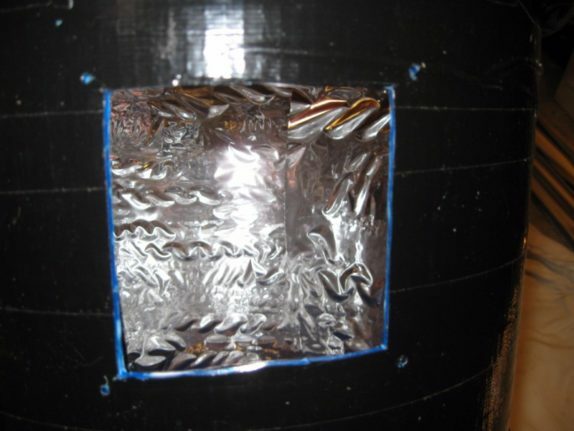 Remove the mylar that covers the socket holes. Step twenty-two: Wrap the outside of the light top with black tape. Step twenty-three: Drill two holes, one above and one below the socket, to accomodate a zip tie that will hold the whole socket assembly in place. Feed the zip tie into one hole, around the Y of the socket, then back out the hole, and zip it tight around the socket. Do this for both the Y-shaped sockets. Step twenty-four: The other socket at the top of the bucket lid is more difficult. 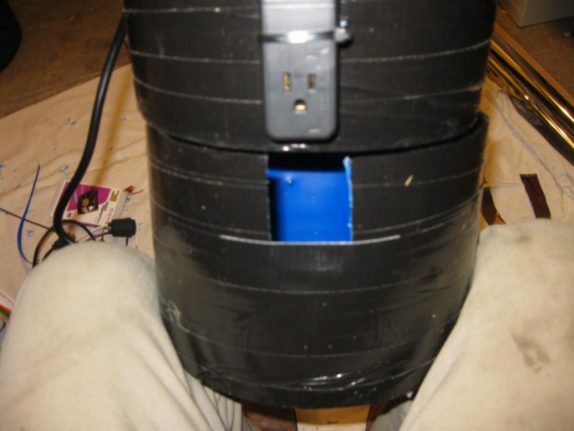 wrap a zip tie around the socket, then apply a lot of glue to glue the zip tie to the socket and the bucket lid. 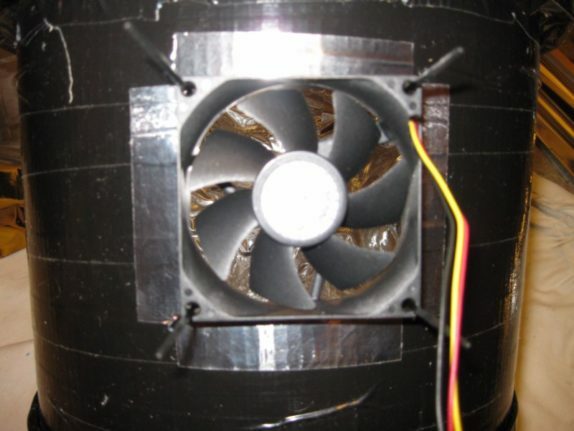 Step twenty-five: The next step is installing the fan on the light lid, this fan will blow air out of the space bucket. Use a dremel tool to drill a hole in the lid the size of the fan. 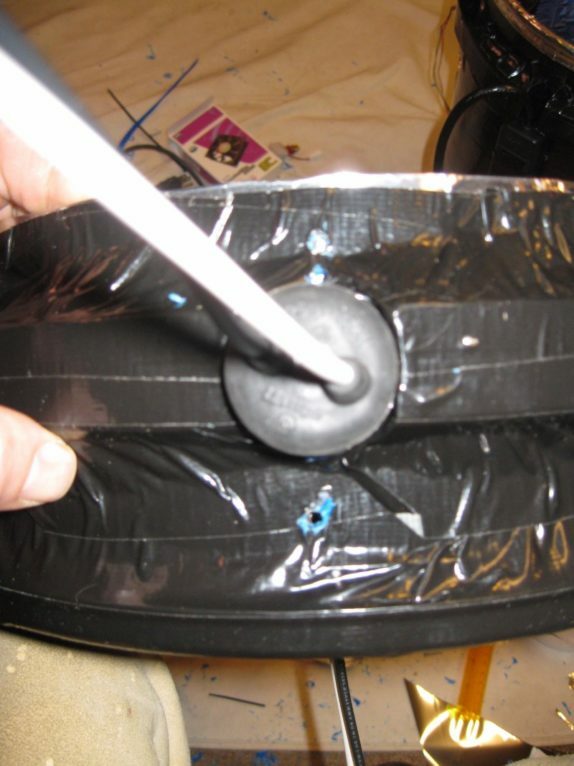 Place the fan in the hole you drilled, use tape again to avoid any light leaking out of your bucket. Step twenty-six: Time for the wiring! You need wire strippers, extra wire, an extension cord, electrical tape, and wire nuts of several sizes. 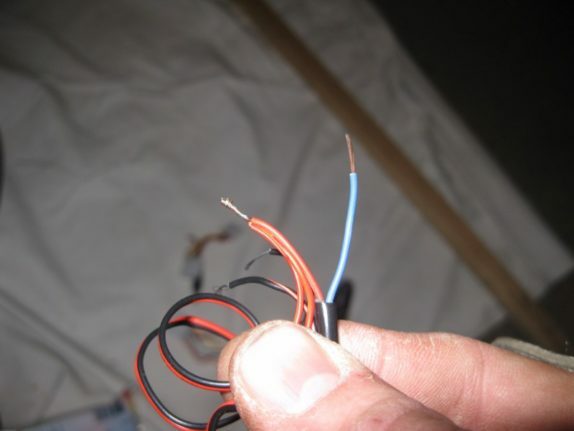 If the wires won’t reach a common point, cut 4 lengths of extra wire and strip the ends of these extension wires. Use 4 yellow nuts for the 2 wire junctions, and 2 big red ones for the 4 wire junctions. Screw the wire nuts onto the ends of the wires, and tape the wires together to provide some strain relief. Do this on all 4 wires on the side sockets. Step twenty-seven: Use your wire cutters to cut the female end off the cord. Split the extension cord wires. 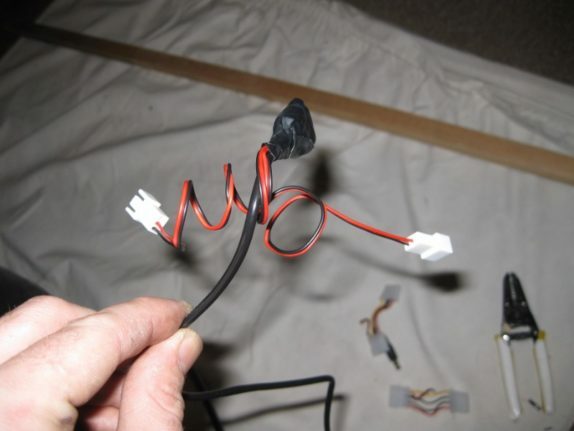 Strip about 1/2″ -5/8″ off the end of the extension cord wires. Step twenty-eight: Bring all the black strands from each socket together with one wire from the extension cord. Pay attention because we added green extensions to all the cords. Step twenty-nine: Tape it all together, then twist the wires together. Twist a wire nut onto the 4 wire junction. Repeat for the white set of wires. Step thirty: Using electrical tape, cover all the wires. Step thirty-one: Time for the fans to get their electrical supply. Clip the end of the 12v power supply. We are going to connect the fan connectors to the 12v power supply. Each fan has a connector that plugs into these small connectors. Trim back the black insulation. 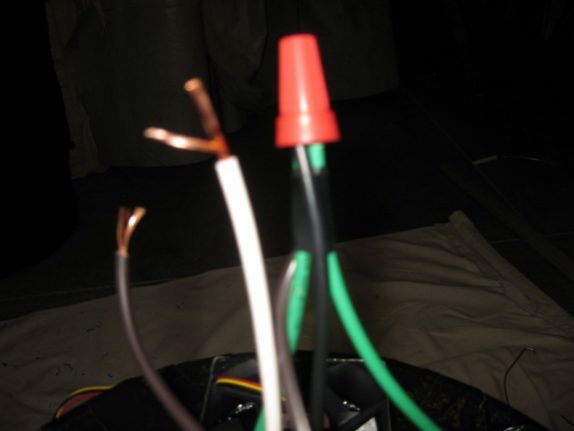 Strip 5/8″ of insulation from each red wire, twist together and tape with electrical tape. Do the same for the green wire. Add wire nuts to the ends of the exposed wire. Connect these to the fans. Step thirty-two: Plug in the 12v power supply and both fans. Test them to make sure they blow the right way! Step thirty-three: Wrap up the wires with tape to increase their sturdiness. Your bucket is now complete and ready to grow something in! You can now put some dirt at the bottom of the bucket and insert seeds. If after reading this guide you happen to have any further questions or recommendations, please don’t hesitate to leave a comment below. 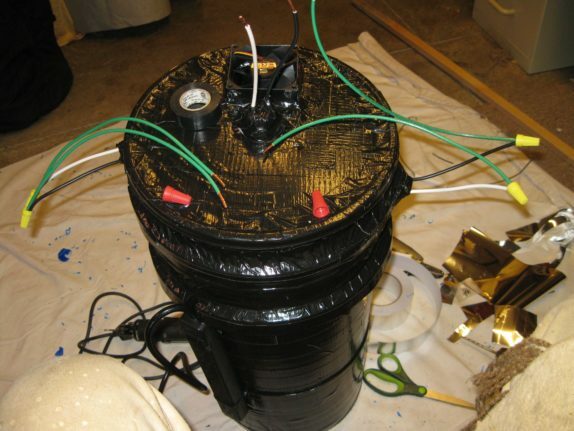 Our thanks go to Reddit user /u/McScroggins for documenting his spacebucket design. Further information can be found on spacebuckets.com. An amazing idea! Have you actually tried this out, if so did you keep a record of your results? For the most part, it worked out fine for me. That said, I’m left with two extra buckets and a rather short grow space.